Within this chapter I analyses the typology of participation presented in chapter four in more depth. The focus is on children’s agency within child protection interventions; that is, their capacity to act with autonomy and independence. The problem of children’s agency is probably the most significant contemporary issue in the study of childhood, but to date there is very little empirical work that attempts to analyse it theoretically. This chapter addresses this deficiency by foregrounding and interpreting the social actions of children and the effects that their actions cause. It bridges the gap between the macro and the micro; the structure (which will follow in chapters six and seven) and the actor (presented in chapters two, three and four). 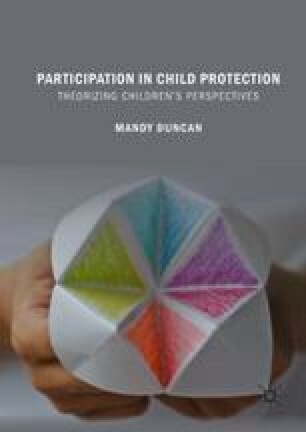 It connects the social conditions of childhood to the actions of children in their particular contexts and questions whether children are capable of knowing about, reflecting upon, and reconstructing the conditions of their participation in child protection interventions.